We are thrilled to offer you a new exclusive jade yoni egg, the Forest Nymph. Beautiful blue-green jade comes from the heart of the Siberian taiga, wild and enchanted ancient forest. These rare beauties are hand crafted with love by the master carver, Alexander, in his artisan shop in a small town in Eastern Russia. Alexander fell in love with nephrite 20 years ago, and he puts his heart and soul into every piece he creates. Own it, cherish it, pass it down the generations. We hope that this yoni egg will bring you healing and serve you for the years to come. 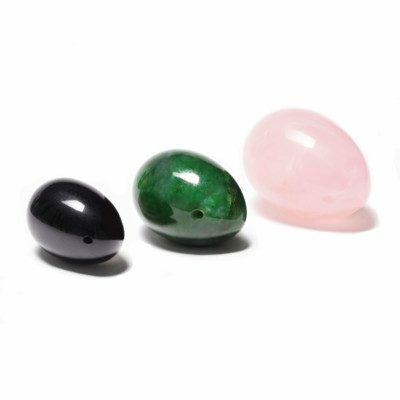 Nephrite Jade is the best material for a yoni egg intended for regular wear and practice, it is also the suggested stone of choice for beginners for a number of reasons. This Yoni Egg comes with a signature gift box, carrying pouch and practice guide. Free priority shipping. Nephrite jade is known to be the best stone for the female reproductive system. It’s a very heart opening stone and can help aid in cleansing unwanted energies. With a regular practice It becomes important to energetically clean your jade egg by putting it in a bowl of sea salt. Emotional/Spiritual benefits: Nephrite Jade is especially beneficial for women. It is believed to increase the range and intensity of her energy field or aura. Nephrite Jade is the kindest most grounding stone in the universe and is endlessly devoted to its owner. It is a gentle gem intended to protect and encourage peaceful energy in the heart and throughout the body. Jade is a crystal of love. It is supportive of new love and increases trustworthiness and fidelity. This crystal is ideal for women who are particularly sensitive to energy, healing from an illness, or overcoming sexual trauma because nephrite jade quickens physical and emotional healing processes. Jade is also known as the “dream stone”, and assists in dream recall, analysis, and connection to ancient wisdom. It aids in balancing male and female energy and works to stabilize and protect the body and mind. This Yoni Egg comes with a signature gift box, carrying pouch and practice guide. Please note that each stone is unique in appearance as every one of us. Because all of our yoni eggs are cut from 100% natural nephrite jade, there is always color variation. Actual yoni egg you received might not look exactly the same as the one shown in the pictures above, but the color will be similar. Our Jade Eggs and are perfectly smooth and are always inspected for any chips and cracks before shipping. No chemicals are used during the manufacturing process. No fillers or dyes – the only material of the egg is the crystal you ordered and natural beeswax. We only stock quality gems suitable for internal use. Important: Finished with the natural beeswax. Due to the fact that all the Siberian nephrite jade yoni eggs are handcrafted in small batches we are only able to offer a limited amount. Please contact us at [email protected] if you wish to pre-order this yoni egg. Due to the intimate nature of the product returns are not accepted. on the rare occasion when the crystal is damaged during shipping please contact us within 7 days after receiving your order so we can send you a replacement. Black Obsidian Yoni Egg “La Luna”.